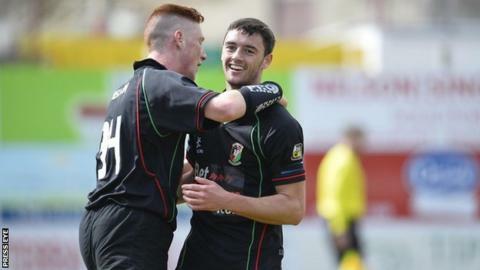 Glentoran finished their league campaign on a high by beating Portadown at Shamrock Park thanks to goals from Fra McCaffrey and Kym Nelson. McCaffrey provided a neat finish in the ninth minute after David Scullion and Danny McKee were involved in some skilful build-up. Peter McMahon slotted home a low shot on 39 minutes after Stephen Gordon had lost the ball inside his own half. Portadown finish fourth in the table, with the Glens fifth. For the Glens, it was their third consecutive league victory.